I'm making a point of taking several photos of the construction, as it will eventually make a collection of interesting 'then & now' pictures. BTS Green line extending north to Saphan Mai, and eventually Lam Lukka, if this map is anything to go by. I'm a rail fan, and was quite upset by the closure of the rail museum next to Chatuchak Park last year. Ok it wasn't the most well kept place but nice to know there are some fellow enthusiasts in this city. I would imagine the place shut due to lack of interest and funding. Trends come and go fast nowadays. The first stop north of Mo Chit will be called Lat Phrao Intersection, not Horwang as shown on that map. Horwang would be more apt as it's next to both Soi Horwang and Horwang school. Here are a few pictures of the current construction site around Central Lat Phrao. Same footbridge but looking the other way towards Chatuchak. A lot of building going on. This was taken about 30mins before the first picture. These pics show the site of the new station complex. Workers on site below the footbridge that leads into the Union Mall. Further on from this footbridge are several flyovers which may mean the line rising several metres further than standard height to clear these obstacles. Unlike the Ratchayotin flyover, I can't see them demolishing all those. But you never know. The next lot of photos will be on the site of Ratchayotin Station, further north. Then after that I will follow the route of the line and hopefully this will make a fine collection. I was quite surprised by the lack of decent pictures showing the original skytrain being built in the 90s, so I'm making a point of taking these. Don't forget about what happened the other day. How many years of construction still to go? Hardly surprising to be honest, Ital Thai haven't had a good month so far. Further on from this footbridge are several flyovers which may mean the line rising several metres further than standard height to clear these obstacles. Unlike the Ratchayotin flyover, I can't see them demolishing all those. But you never know. BANGKOK — Construction of a bridge between BTS Mo Chit and a new elevated train line will begin in February, a director of the project said Monday. To avoid closing down traffic at one of the busiest crossroads in the capital, the Green Line extension’s tracks will soar over the tangle of crisscrossing bridges and expressways at Lat Phrao intersection, according to Surachet Laophulsuk of the Mass Rapid Transit Authority, or MRTA, which is building the extension. 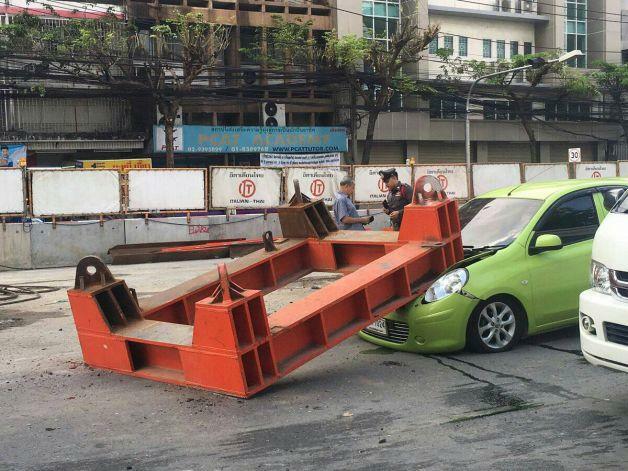 Dismissing reports on social media that Lat Phrao intersection will be closed during construction, Surachet said the MRTA would take lessons learned late last year from dismantling the Ratchayotin Intersection overpass without interfering with the traffic. “It’s like what we did at Ratchayothin. Let me stress my point: We won’t close down the intersection,” Surachet said. Starting just north of the three-way intersection, the elevated Green Line will connect Bangkok’s downtown with its northern suburbs. The MRTA hopes to connect its southern terminus at what will be the Lat Phrao Station to BTS Mo Chit, which is just south of the intersection, by August 2018. The Green Line itself will be finished by February 2019, but when it begins operating depends on negotiations with Bangkok City Hall, Surachet said. The flyover across Lat Phrao intersection will run 26 meters above the ground, a height of about eight floors, making it one of the tallest rail spans ever built in Thailand, he added. Last edited by DJ Pat; 24-03-2017 at 01:20 AM. I was told by the staff that Mo Chit station may be relocated 100m further north at a higher level to prepare for the elevated structure that will take the line 26m up over the Lt Phrao intersection. Trains will be get turned around at Saphan Kwai during that time. Sena Ruam station will finally get built and the extension will run as far as Lat Phrao until the whole line is complete. At the south end, Samrong will be open in the next couple of months and rather than amend and replace the map again, the extension south is now shown. You should take a 522 expressway bus from victory monument up the expressway past bang sue to rangsit to get a great birds eye view of the new Bangkok Station. The construction site is huge and takes several minutes to pass through even at expressway speed. I did go past that last week and they've cleared more land for the whole complex. I took a load of pics of the station progress as of last September too, from the train heading to Hua Hin. Last edited by DJ Pat; 26-03-2017 at 10:16 PM. Every time I drive into London the skyline is different, so many new buildings going up. Nobody knows, it's all ongoing of course. Here are several videos on the construction progress, including each of the new stations north of Mo Chit. Worth a look if you have time. Definitely an ambitious project, worth a look though. DJ , I enjoy your posts on the train system . So please continue . Thanks . I don't think much of the design of the stairways of these stations from Bangkhen to Don Muang. They are open far too much to the elements. The slightest bit of rain with the slightest bit of breeze and the steel steps are going to be damned slippy. Not to mention getting soaked and eyes poked out from umbrellas of people a step or two in front of you. The scene yesterday, the first pillar going up, slowly..Operational by 2018? What will be the differance between the red line and the green line at Don Mueng ? From the red line it looks like a good walk but I thought i saw a map where the green line was supose to connect. Never mind as a look at the map and saw green line going behind the airport.... still like to know how they will get people over expressway from red line. Last edited by soi23; 20-04-2017 at 08:30 AM. Next time you are out and about you might like this restaurant? It is 50m off Rot Fai 1 Alley Bang Sue. More atmospheric than artifactual . But if you are nearby? Pictures of old trains etc on the walls. I guess it is where rail workers go/used to go. Thread bump the same time I am going through a few of the latest construction progress videos. I hope the prices reflect this, it is my kind of place and I'm not too far away...Pics will follow soon. Cheers. Did you ever get there? Construction around and next to Major Ratchayotin, ongoing. They've slated it as opening within 2yrs, which looks a bit distant. Last edited by DJ Pat; 01-05-2017 at 04:51 PM. Last edited by DJ Pat; 01-05-2017 at 05:11 PM. The green line is the BTS. The red line is a different system - SRT, Elevated Railway. Running from the terminal being built in Bang Sue.